Considering the time of year, and being new to blogging, I thought it appropriate to speak about Firsts – or new Starts – they are connected are they not? We all experience Firsts – blogging being my most recent! But First’s appear to slow down a pace as we get older – or do they? As adults do we forget to take off our blinkers and view the world differently? Why not take a kids view on things? – the awe, the curiosity, the excitement, the in-the-moment concentration that they give a new discovery, be it a weird looking bug or tasting a lemon. So in preparation of today’s post, and with the start to 2015 – I thought I would take a different look at MY view on the the new year – and look to my past Firsts, to perhaps prepare for some future ones – or for the adults out there who like to put a power word on it – my 2015 ‘Goals’. After all, isn’t a Goal something we aspire to achieve (for clarification, I am not talking scoring between goal posts here) – and if it is a Goal, doesn’t this mean we have not done it before, and by consequence, it is a First. I think Michelangelo is quoted somewhere as saying ‘I am still learning’ as he painted the Sistine Chapel. But what about the small stuff, the bits that really only matter to us as individuals. So for 2015 I am not going to make any resolutions – as these are so often based on failures, or trying to change the negative – I am going to revert to the past to go forward. If that makes sense? Not a bucket list – more an appreciation. An appreciation of any Firsts that I may continue to experience, to recognise, and to celebrate them. Even if I think I have done it all before, to approach it as if I have not – with awe, with curiosity, with excitement. 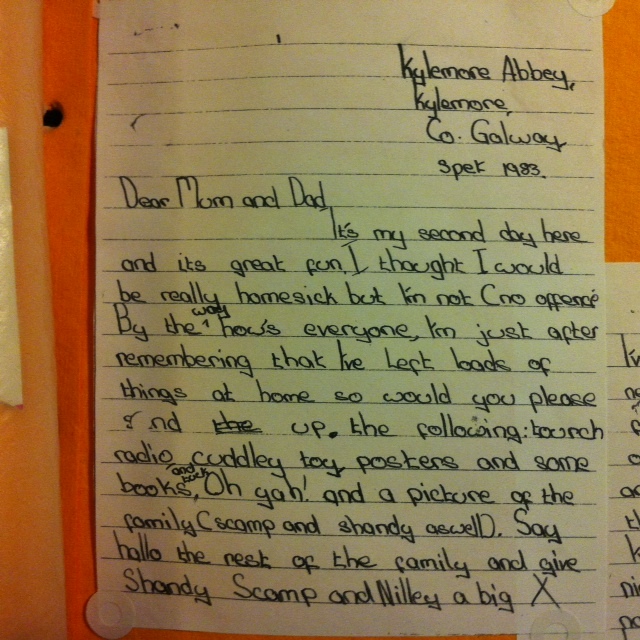 To that end, I am happy to share my first letter home from boarding school – written at the age of 12, back in 1983, having settled in a few days to Kylemore Abbey School for Girls, Connemara. I don’t think it holds any life changing messages. But I am happy to say that, thanks to my father’s archiving, that the letter remains (misspelling and all), as opposed to decomposing in some land fill – and I appreciate that, and it, on so many levels – my first letter home – the first of many letters that would follow, but this one capturing one girls’ mind set as a boarder, starting anew, making that fresh start to secondary school – and what was important to her at that time, in that moment when she took her new letter writing set and quickly penned a letter home. I feel strangely reassured that, 30 years later, my needs haven’t changed much! Here’s to yours for 2015. I’ve made loads of friends so theres no need to worry. 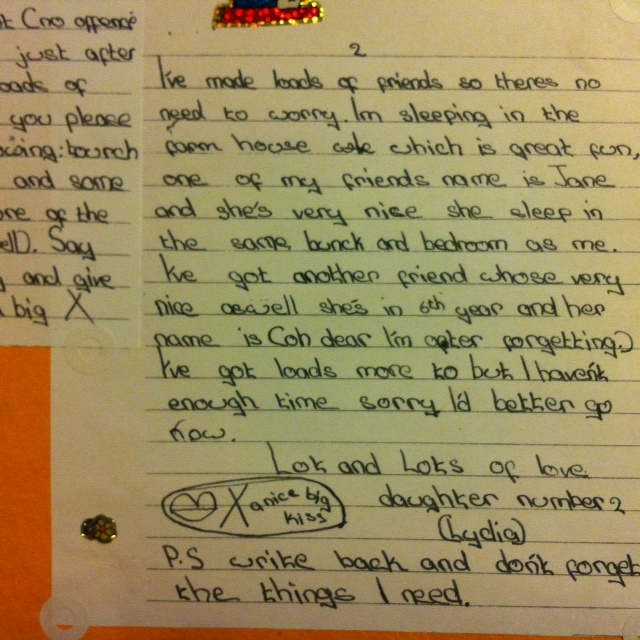 Im sleepin in the farm house wle, which is great fun, one of my friends name is Jane and she’s very nice she sleep in the same bunck and bedroom as me. I’ve got another friend whose very nice aswell she’s in 6th year and her name is (oh dear I’m after forgetting.) I’ve got loads more to but I haven’t enough time sorry. I’d better go now.